We offer hosting services along with design and development services to help make your life more simple! Providing web hosting services also enables us to have more control and flexability with the design and operations of your new website. Our system administrators diligently tend to our servers, keeping our hosted sites reliable, dependable... loading pages and applications with consistent speed and connectivity. We've been offering hosting services as a convenience to our clients since 1996. Not only does it relieve you of having to find a hosting company for your new website, but it helps us to provide you with the best possible setup and configuration for your particular site. Our server connectivity is provided to us by one of the top internet service providers in the world, and our secure servers are certified with leading agencies for web security services. Who needs another monthly bill? 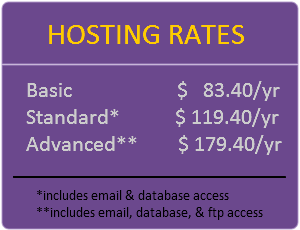 Our hosting plans are based on a yearly rate, saving you time and money! Our hosting rates are comparable to industry standards, yet our plans are more flexible and expandable than most. 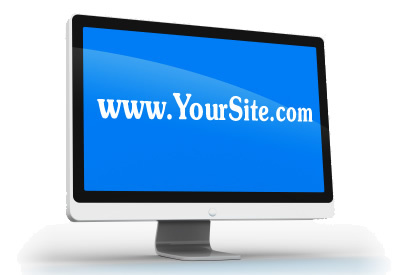 We'll help you decide on a domain name, get it registered, and have your site active and online as quickly as possible. Every hosting account comes with server statistics software installed and ready for you to track and analyze your website visitors and traffic. We monitor and protect our web servers 24/7 against viruses, hackers, and spammers! Our servers have a 99.6% uptime (downtime being software and security updates!). For peace of mind and worry-free ecommerce or business-to-business applications, our servers are securing your website! 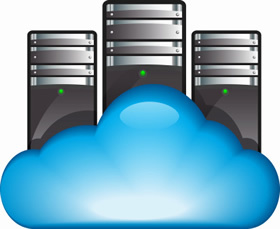 Trust your website hosting services to cguHOST, and leave the trouble and hassles to us! We take care of the monitoring, maintenance, and support of your website, and can provide you with access to your SEO statistics, log files, and monitoring reports.